Another one of our friendly “neighbour” radiofax stations is HSW64 from Thailand. 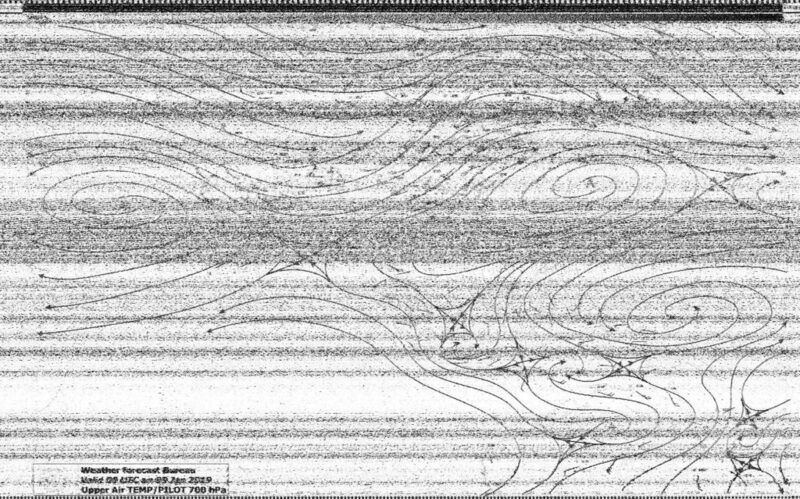 This station is listed in the NWS/NOAA radiofax schedules as 7395kHz which is its SSB tuning frequency – the centre frequency is actually 1.9kHz above this. 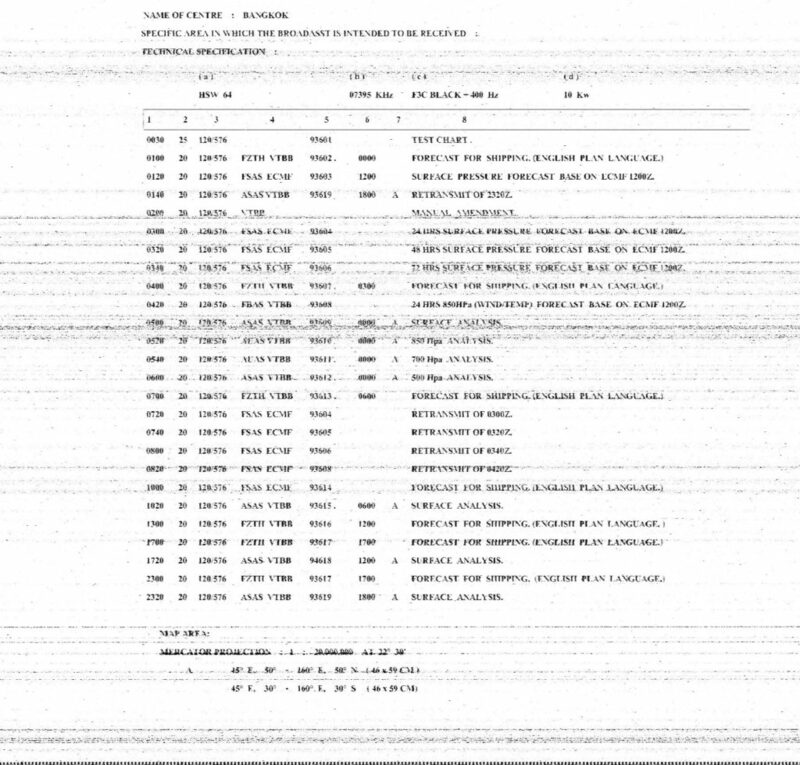 This is common to SVJ4 from Greece which also has its SSB tuning frequency listed instead. The schedule lists the transmit power as 3kW, although it seems the actual power is 10kW. Despite this, the station remains difficult to copy cleanly from home. As a result, I relied on a number of KiwiSDR receivers – especially VN/SWL in Vietnam and SWLOI33 in Jakarta, Indonesia. I did, at one stage, also make use of VR2BG in Hong Kong which often has the stronger signal, however, due to the aggressive daily time limit, it was not possible to use it to decode longer charts. It seems rather fortunate that I was observing HSW64 at the moment that I did, as it seems the format of the charts was undergoing a change at the time. As a result, it is possible to see both old and new style examples. The faxes shown are a snapshot in time and are not updated. 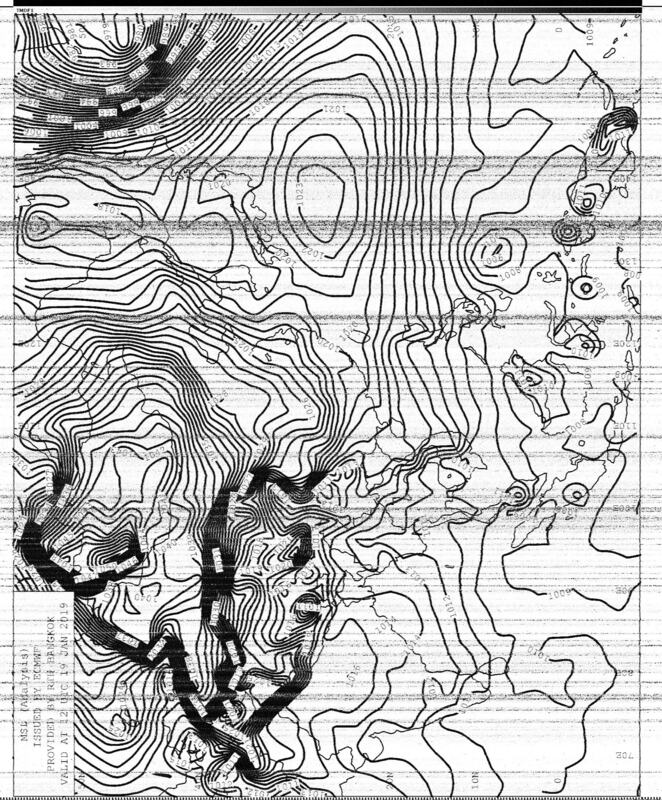 Charts are not to be used for navigation purposes. 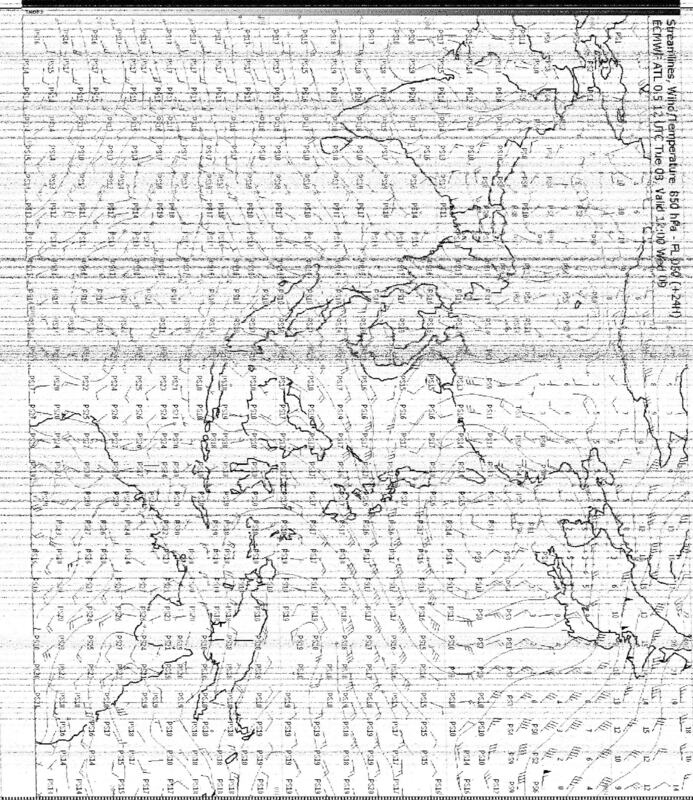 Copyright in the faxed material belongs to the transmitting entity, the Weather Forecast Division of the Thai Meteorological Department. 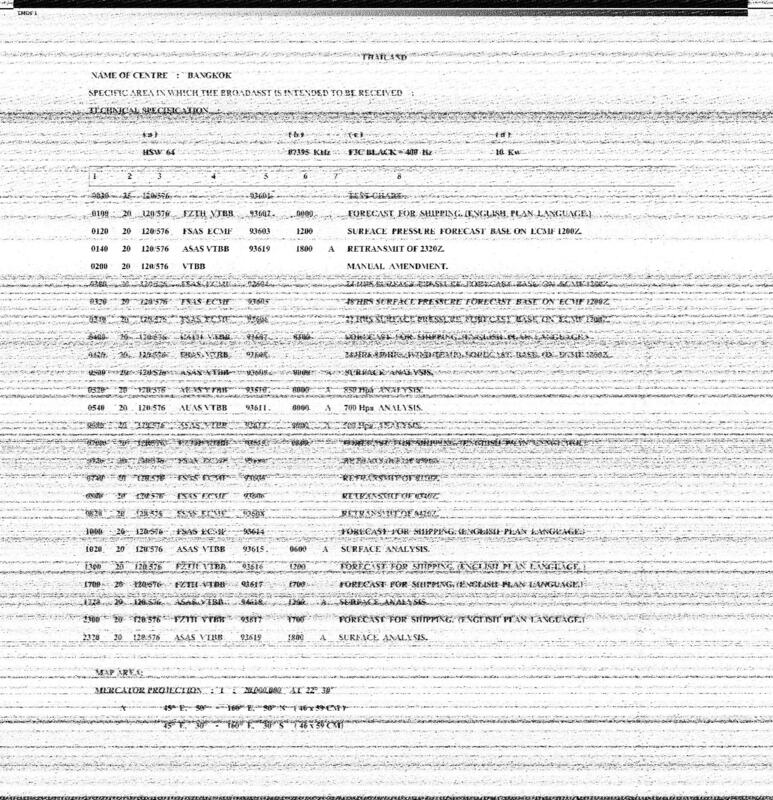 Faxes are reproduced for documentary purposes to show the transmission format characteristics, chart formats in use and as proof of propagation, station activity and reception on the dates mentioned. The first chart scheduled at 0050UTC is a test chart. At this time, I had not tuned my slant correctly, but was able to receive the cleanest copy, so I present that above. 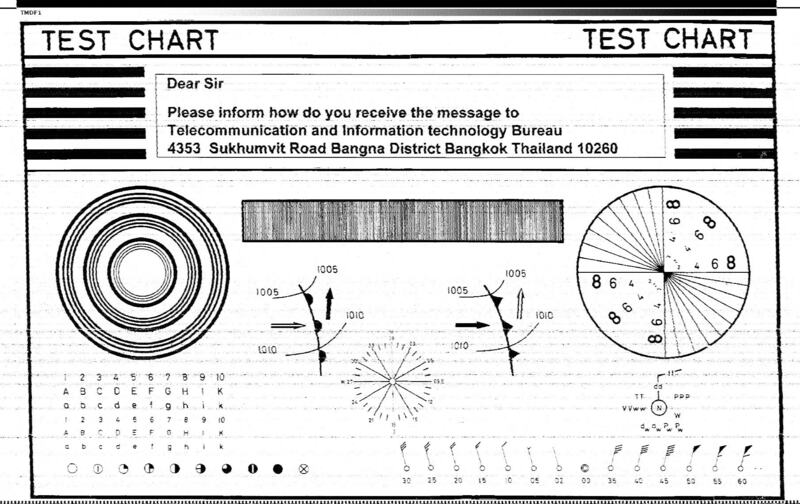 The test chart does request a reception report sent to their Telecommunication and Information Technology Bureau and features a number of different symbols and lines testing resolution. This chart is a “short” chart. 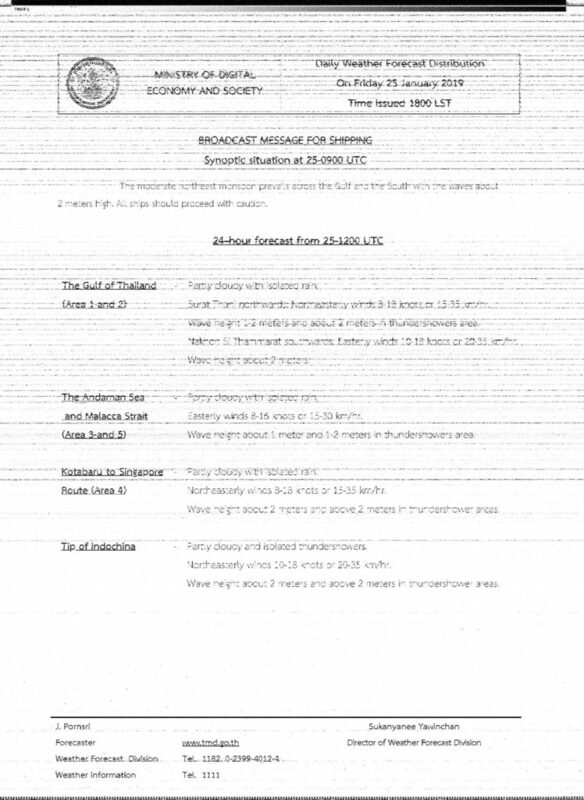 One thing that is apparent, however, is that they sometimes don’t adhere to the scheduled time – this fax was received at 0028UTC and it seems common for them to fire their charts off early. The chart shows a relatively short phasing period, followed by a white-to-black gradient bar with the text TMDF1 at the top left. The sync margins are white. This bears significant similarities to that of SVJ4 Greece and CBM/CBV Chile, as they seemingly use similar equipment. 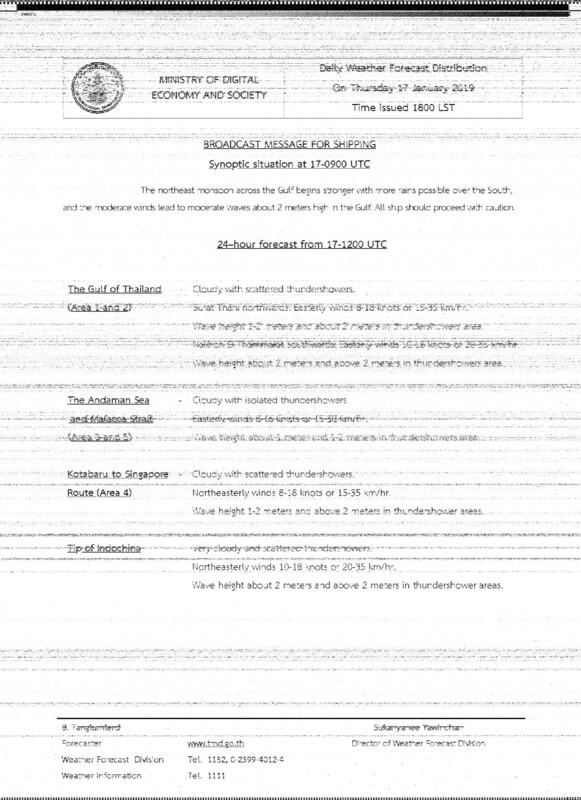 Each forecast is signed off by the forecaster at the bottom. The above example was dated 17th January 2019. Another example above by a different forecaster on the 20th January, following an identical format. Finally, a third example, on 25th January 2019. It seems that the reception is normally that poor, resulting in the thin lines in the text nearly disappearing. This can be exacerbated by doppler shifts which “smear” the lines across the page and reduce contrast. 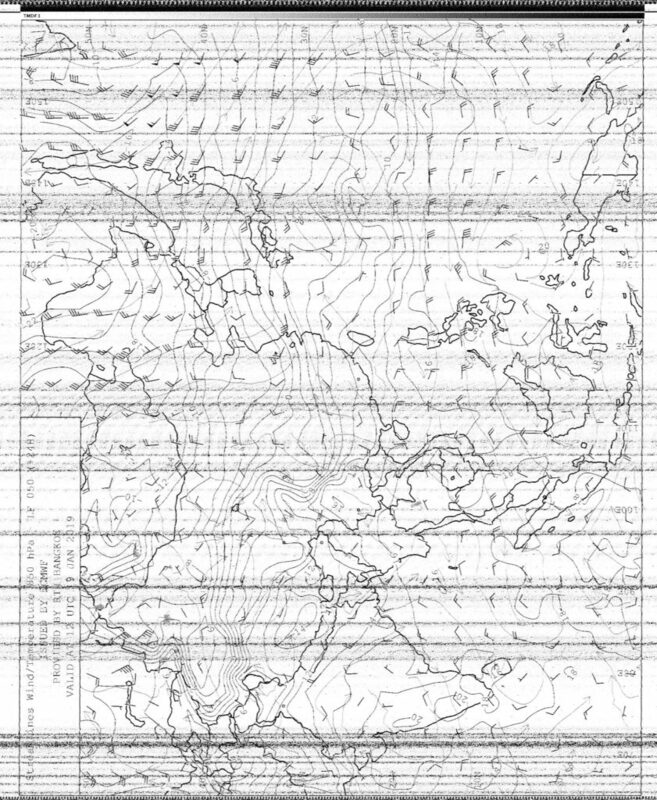 The surface pressure chart appears to have been updated, resulting in a taller chart than most charts seen elsewhere with the exception of JJC news faxes. This one takes advantage of greyscale as well, although the legends are a bit “thin” to be read. The above was received 17th January 2019. 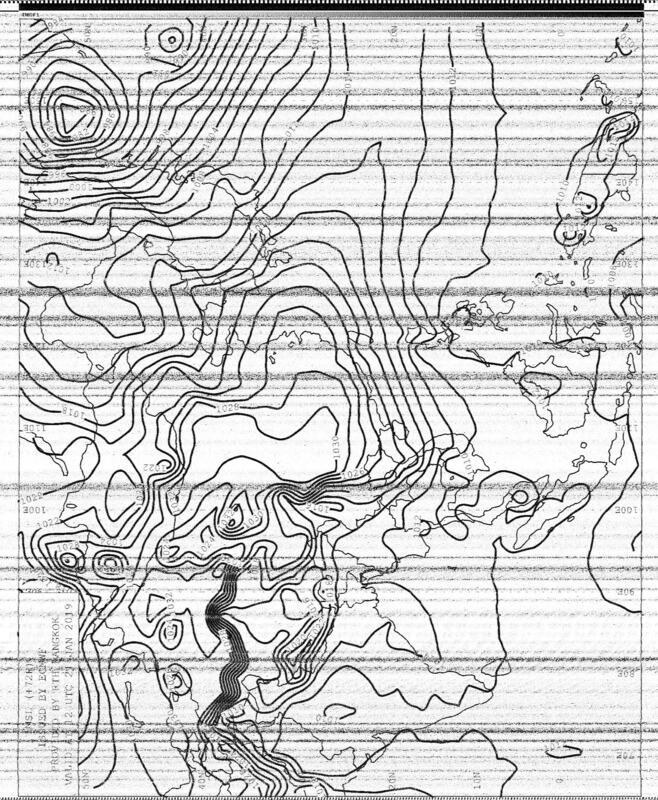 Another example of the surface pressure chart, as received 18th January 2019. 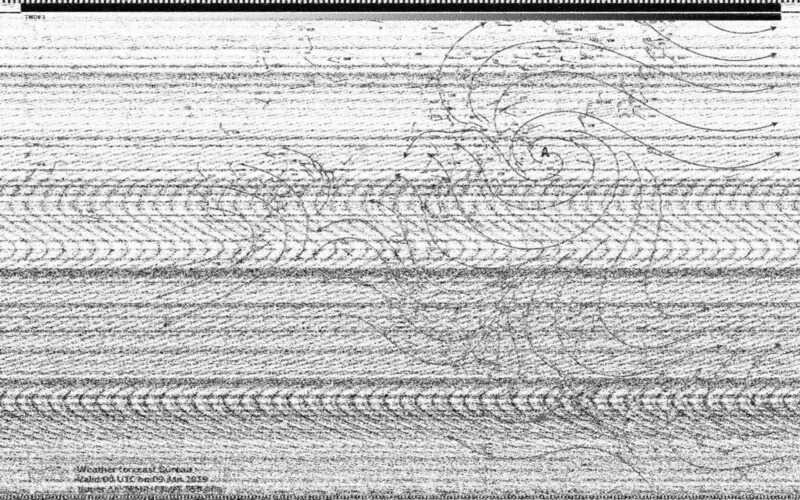 The chart uses the full width of the image and looks pretty nice compared to the more primitive graphics normally seen on weather faxes. 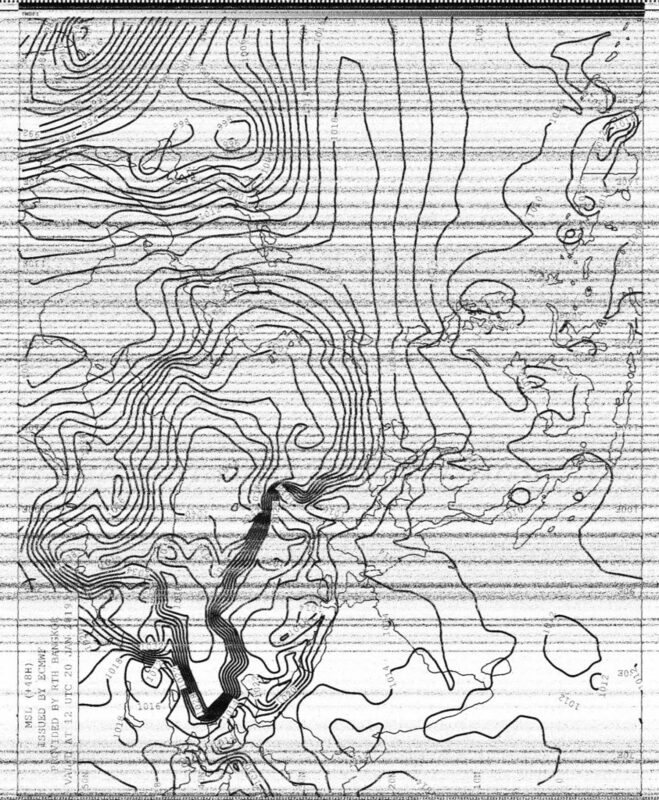 The standard (older) surface pressure analysis chart looks like the one above. 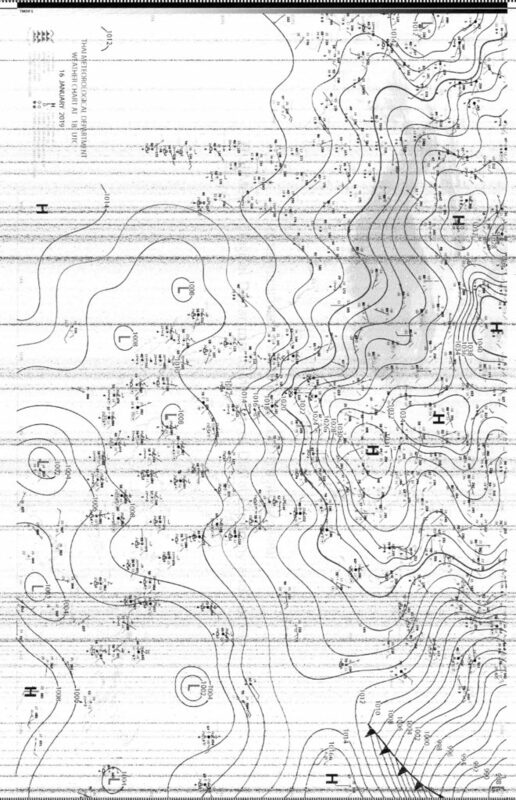 The standard charts are transmitted filling the width with the title in the top right. 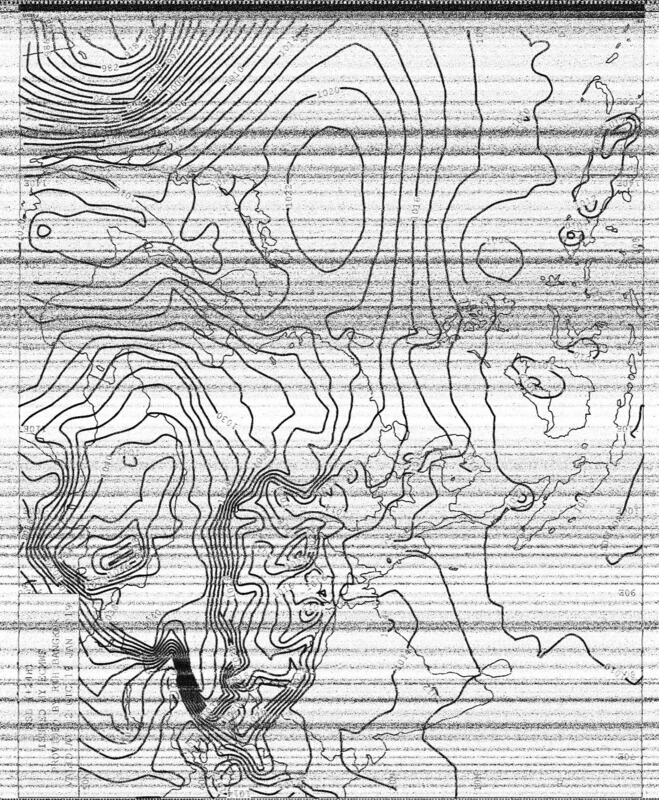 The chart is not as tall as the surface pressure chart, this example received 19th January 2019. The newer version, received on 20th January 2019 is slightly taller and sent in the other orientation – title in the bottom left. The contour lines are much bolder, which improves readability at the expense of problems in area with fine details. 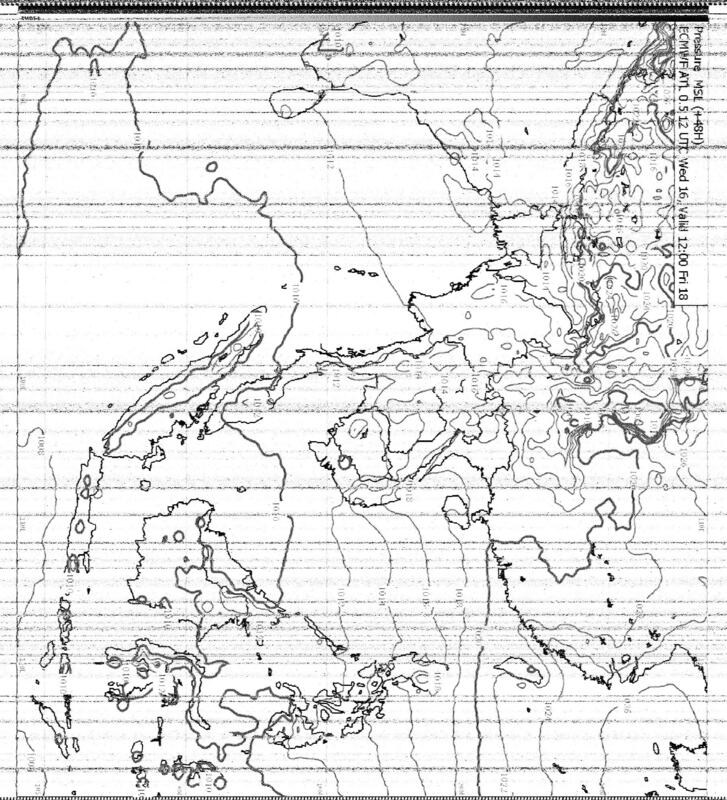 The caption says “Issued by ECMWF provided by RTH Bangkok”. The broadcast schedule is the next item on the transmission line-up, which uses slightly bolder text than the forecast for shipping, but at a ridiculously small font size. Due to the noise, the schedule is a little unreadable. I managed a partial reception on another day that was a little better – that is shown above. 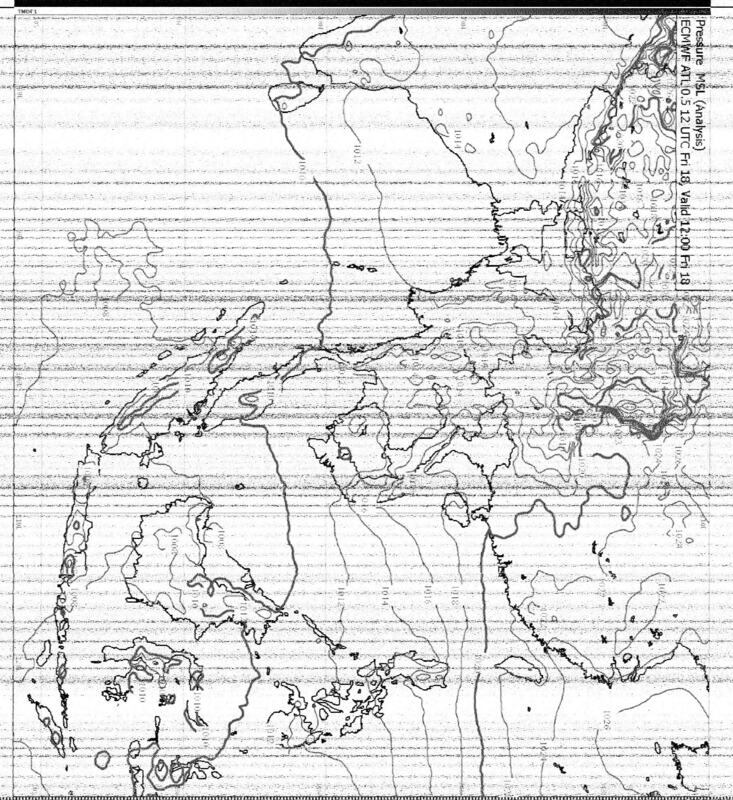 It seems that the station claims to transmit at 10kW, although interestingly, the intended area for the broadasst (sic) is not mentioned. This is followed by the surface prognosis charts for +24, +48 and +72 hours. The above show examples of the charts in the “older” format, received 10th January 2019 (+24h) and 17th January 2019 (+48, +72h). The newer format equivalent charts with thicker lines and taller images are shown above, all received from the 19th January 2019 broadcast. 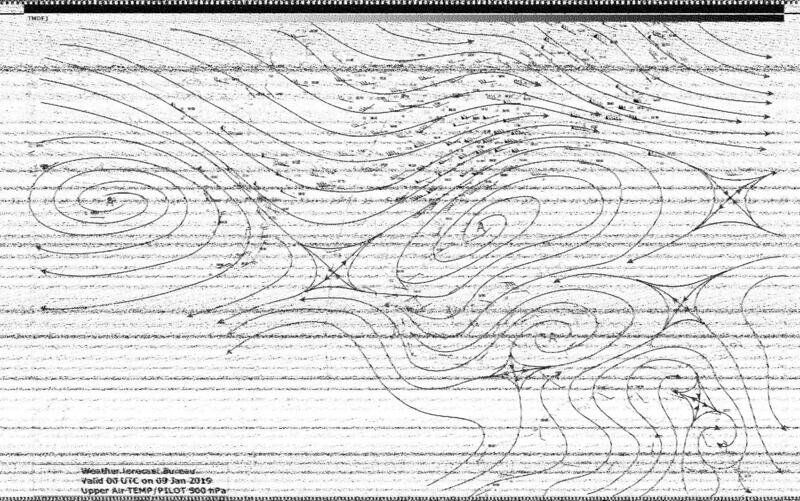 That chart is normally followed by the 24 hour 850mb wind/temperature streamlines prognosis. The above shows the older format received 9th January 2019, which in itself, is a rather tall chart. The new format received 19th January 2019 is above. 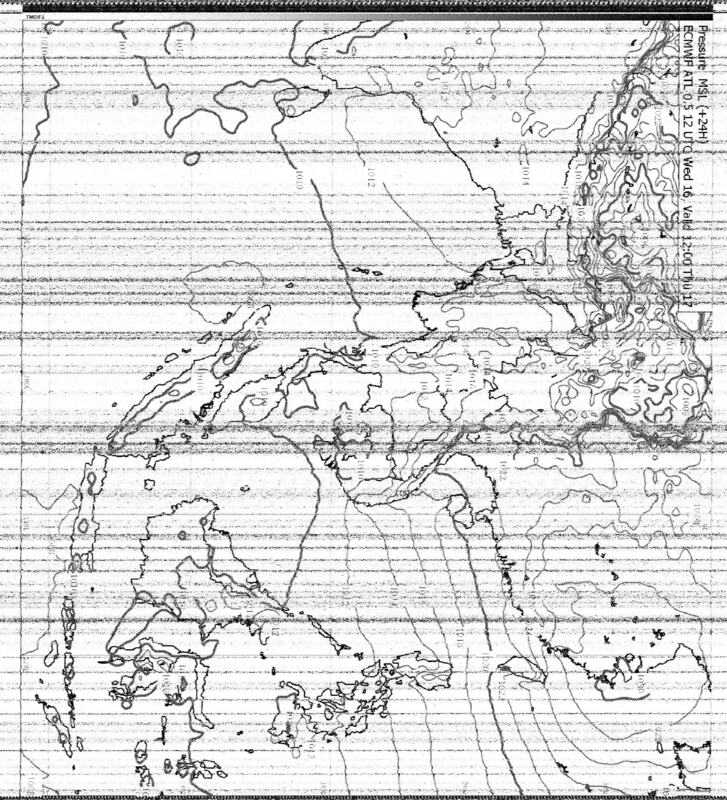 The three remaining types of charts issued are analysis for 850mb, 700mb and 500mb. These are short charts, unlike the others, and due to the transmission time are very rarely copied well. However, the above collection of charts covers the format of all the charts issued by HSW64 at this time (to my knowledge). As HSW64 only operates one frequency, copying HSW64 can be quite tricky. 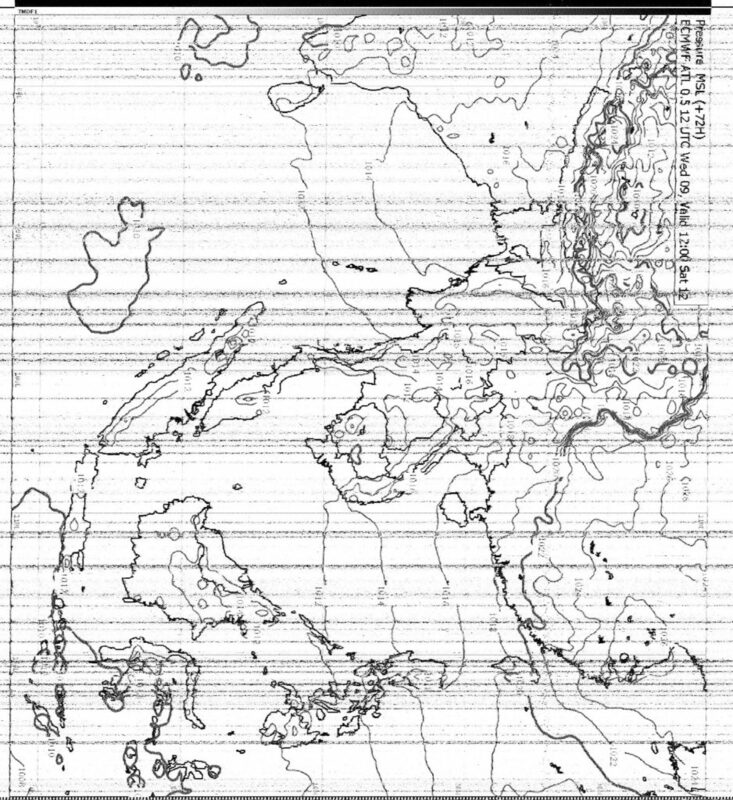 Despite high transmission power, it is rare to find perfect copy due to interference from other AM stations and propagation conditions. A variety of charts are broadcast with new formats showing nicer “bolded” lines for easier reading. The forecast for shipping in English is one of their most frequently broadcasted charts, but has oddly thin text making it hard to read in poor signal conditions. 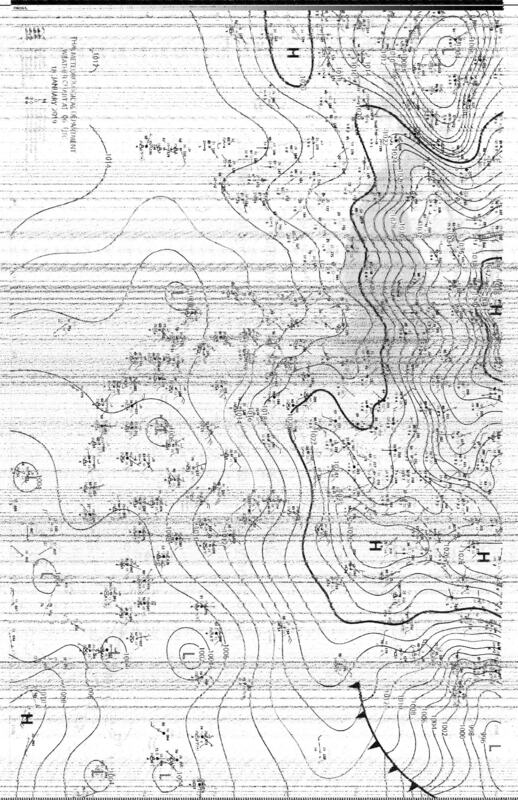 It is one of the few stations that actually put out significant amounts of text in their radiofaxes, with most other stations conveying charts/images only (with the exception of JJC Kyodo).